In case of matching structures, a match list appears, where the user can decide about the compound to be registered: to get a new ID (Register as unique), to move it under an existing tree (Accept) or to move it under an existing tree, but changing the structure (Replace). The match list is a popup window that shows the possible matches of a structure to be registered or amended. There are two different types of match lists: component level match list and multi-component level match list. The component level match list is shown for singles (Figure Reg 1) and for all of the components of a multi-component structure (Figure Reg 2). 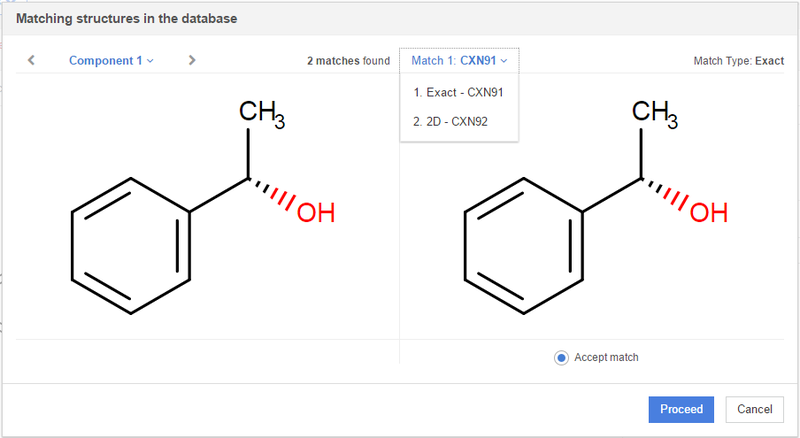 In case of multi-component compounds, we can navigate between components with the aid of the arrows located above the input structure and for each component the match (if available) is displayed (Figure Reg 2). The input parent standardized structure of the actual component (generated after applying the fixers) is on the left side, the matching parent structure is on the right side. The possible match actions (accept, replace or unique) can be selected by buttons located under the matching structure. If more than one match is available, then the match itself can be selected from a drop-down list. The first item of a drop-down list is always the exact match, if available, followed by all the other match types (Figure Reg 2). In case, if an exact match is available, there is only one single [Accept] button available (below the structure of the exact match) - according to the fundamental business rules of the registration -, unique and replace choices or accept for other match types is not allowed (Figure Reg 2). The multi-component level match list is very similar to the previous one, with the only difference, that it shows the whole multi-component parent standardized structure instead of the several component match tabs (Figure Reg 3). In the multi-component match list only those already registered multi-component compounds are listed, that have exact matches for all the components - as discussed above. No multi-component match list is presented if there are no matches (exact/component/external) on that level for the compound. For more details about the multi-component match types please consult the Match types. In the multi-component match only Accept and Unique can be found (Figure Reg 3), the Replace option is not available. Similarly to the single compounds, in case of an exact match, Accept is the only available option. On the Submission and Details page it is possible to change the restriction level of a compound, and as a consequence, when registering or modifying structures, the whole tree will inherit the same level of restriction. 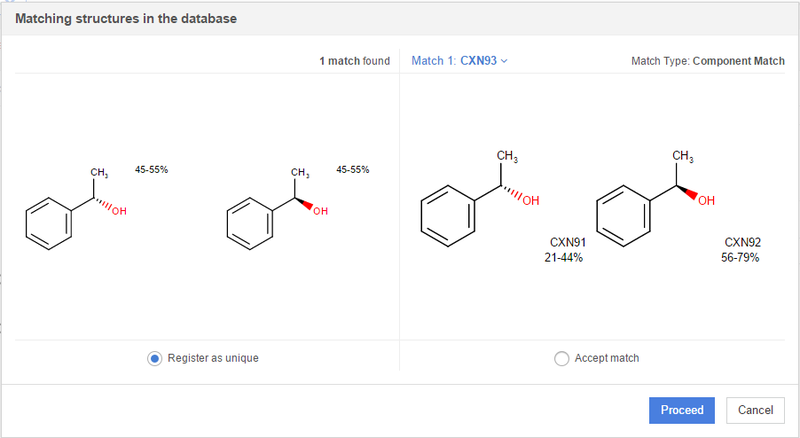 The registration system prevents the autoregistration of compounds having restricted matches (see Registration summary). 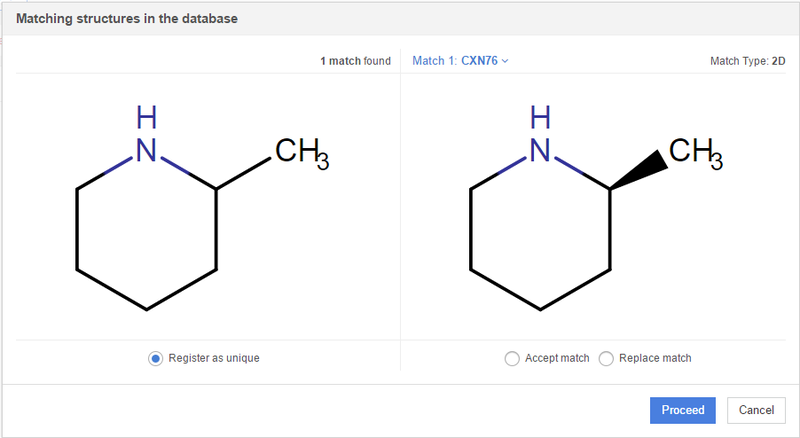 When registering a restricted single compound, and there is a match in the DB with a PCN only component of a multi-component compound, it is only possible to Accept the component match. In this case, a Restriction warning dialog window appears containing the restriction level change of the PCN(s) which will be set, once the [Proceed] button is pressed (Figure Reg 4). The operation can be also cancelled. After accepting the match and continuing the registration, the newly registered component and the already registered multi-component compounds (e.g. CXN83) containing the restricted component, will also inherit the restriction level of the structure being registered. When a restricted compound is going to be registered under it's matching PCN and as a consequence multi-component compounds will also became restricted, then the other PCN only components of the multi-component compounds will also became restricted. 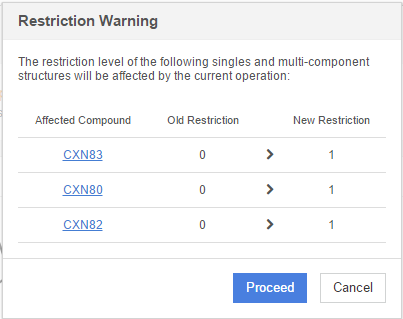 A newly registered (from the Submissiom page) multi-component compound, which has a component match (choosing Accept) with a restricted single from the DB, will become automatically restricted. As a consequence, the PCN only components of the restricted multi-component compounds will also become automatically restricted. The component of the multi-component compound, having In this case also a Restriction warning dialog window appears containing the restriction level of the existing PCN and the LNBRef of the multi-component compound which will be set once the [Continue Registration] button is pressed.